A little over a year ago, my mom's best friend Mrs. Y unexpectedly passed away. It was a sad loss for all of us as Mrs. Y had been an important part of Mom's life (and mine) for over four decades. Mom and Mrs. Y saw each other every week, spending countless hours talking, eating, laughing and going for walks. When they weren't together, they talked on the phone and even had plans for traveling together in the near future. Me (with chocolate on my face) and my childhood BFF. Knowing her dear friend was no longer here, Mom was lonely. She was also saddened by not having had the chance to say goodbye. Though I was concerned, Mom impressed me with her inner strength as she kept up with her daily walks, her cooking and sewing, and socializing with others. Still, there were times when Mom spent most of the day alone, and my heart ached for her as she was clearly missing Mrs. Y. As the year progressed, Mom started going for lunches and walks with her other friends who began calling and visiting more often. Thanks to her friendships, Mom seems much brighter and jollier these days. At age 87, Mom has lost many people including Dad, six out of eight siblings, relatives, and countless friends. Her resilience is admirable. In an article written by Paula Span in the New York Times titled, Tougher Than They Look, scientists suggest that resilience is learned through adversities in early life and people scoring high on the resilience scale are better able to bounce back from difficulties. The article states that even in late life, resilience can be acquired. This is hopeful news! Mom's experience made me reflect on the finitude of life, and has given me greater awareness that every single day matters. Taking this to heart, I feel gratitude for life, including its challenging aspects, and all the people contained within it. Would love to learn about your thoughts and experiences. Has adversity made you more resilient? Thank you for taking the time to read this post. Mom as a young lady. Recently, my husband and I returned from a short vacation and found Mom to be in a very grumpy mood. She stated that she pressed the wrong button on her remote so she could not get the television to work. In addition, the heater wasn't strong enough to keep her living room warm so she was freezing. All in all, Mom said she had a miserable week. I asked her why she didn't call her friends, many of whom live within walking distance, to help figure out her television and heating dilemmas? Many of her friends also have children who live close by, within 5-10 minutes, who could resolve her issues in a pinch. Mom quietly uttered that she didn't want to be a burden to anyone. Though I wasn't entirely surprised by her comment, it made me wonder why Mom might choose to be miserable when her friends would be happy to help her. This episode made me recall an earlier experience of Mom's friend who refused to accept help from friends and family as she faced cancer. Struggling physically and financially, she didn't want to be a burden and thought she could manage on her own. Sadly, the situation did not end well. Both Mom and her friend's experiences made me ponder why it's so hard to ask for help. There seems to be an element of shame involved in admitting we need help, but why? Psychologist Dr. Deborah Serani discusses various myths that keep people from asking for help, and one particular myth that stood out is that asking for help makes us look vulnerable. There is also the stereotype of the frail elder that exists in society, which combined with the myths of needing help, that might make some older adults hesitant in asking for assistance. Mom's situation might also include some cultural expectations she has for me as her daughter (but we'll save this topic for another time). In light of this situation, I try not to be too harsh with Mom. Having been raised to not be a burden to others, I may also face similar dilemmas in the not-so-far future. Rather than wondering why other people don't ask for help, however, I think I will muster up the courage to start asking for help more often. Knowing that most people enjoy supporting others, I resolve to be open to receiving help when I need it. I welcome your views on this topic. Do you think independence is overrated? 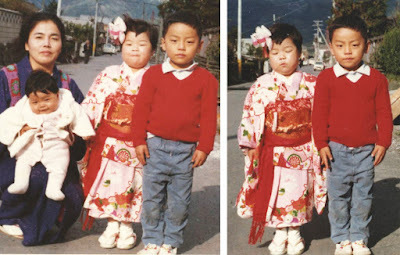 At 4 years old in a kimono, posing with my neighbors. There are many reasons that led to the decision to study gerontology including my experience as a caregiver and that I've always enjoyed the company of elders. Another reason became more clear recently and it has to do with my experiences with prejudice from childhood. Growing up as a minority, there were times I was excluded from activities because some children and their parents did not want to associate with Asian immigrants. While most were kind, some people held assumptions about me based on misleading stereotypes of Asians. As a child, I remember being teased about my physical appearance, especially my almond eyes, and other times when people imitated Asian mannerisms (very much like the Mr. Yunioshi character from the movie Breakfast at Tiffany's) as I walked by. Alternatively, some people were impressed with my ability to speak with no tell-tale "Asian" accent. Though well meaning, peoples' compliments on my English intensified feelings of being a perpetual foreigner. You may wonder how my experience relates to my interest in working with older adults? I believe being treated differently because of what I am has made me sensitive to the way we treat older adults. Ageism is ingrained from childhood and we're not always aware of the prejudicial attitudes we harbor and how it affects people on the receiving end. In the past, I have asked older friends whether they had ageist views in their younger years, and many said they did. One friend who is in her early 70's admitted that as a youth, she disliked older drivers as she often thought, "Get off the road! Get out of my way!" Today, she realizes the irony as younger persons say similar things to her on the road. It may seem that older adults are separate from us, but in a sense, they are our future selves. Most of us will eventually become old. The inclusion of older adults in all aspects of society, therefore, would benefit all of us as we learn to create new possibilities within intergenerational environments. As always, The Legacy Film Festival on Aging gives great food for thought on the multi-faceted nature of aging. This past festival was certainly no exception! 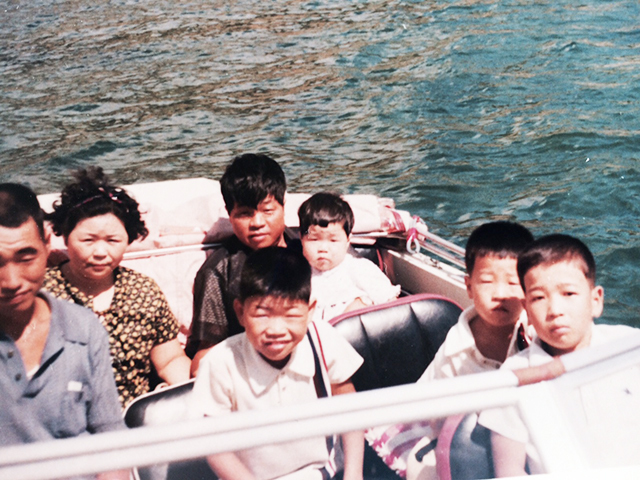 Of the many thoughtful offerings, the documentary Mimi and Dona was the most unforgettable. The story is about Mimi, a devoted mother and lifelong caregiver to her 64-year old daughter Dona who had been born with an intellectual disability. At 92, caregiving was becoming too exhausting for Mimi and she had to make difficult choices to protect both herself and Dona. Filled with both heart-warming and heartbreaking moments, there were many teary-eyed viewers in the audience (myself included) who were deeply moved by the unshakable mother-daughter bond. I continued to think about this story for days afterward, and it brought back many different memories of my dad, including the period before his physical and cognitive decline. Deeply worried about his unmarried daughter, Dad would give me money whenever I visited. I refused the handouts most of the time, but would eventually give in due to his insistence. When I found out that my parents had financial struggles, I scolded Dad for being irresponsible in giving me money. As I recall the hurt look on his face, I now realize Dad wanted to protect me even though he needed protection himself. In seeing Mimi's willingness to sacrifice her own wellbeing to care for Dona, I have greater appreciation for my dad's deep, genuine love. This recognition has been a powerful experience, and perhaps the reason why my eyes were flooded with tears during the viewing. I'm grateful to director Sophie Sartain for sharing the beautiful, personal story of her family, which is a universal love story transcending cultural barriers. Kudos to the Legacy Film Festival on Aging for hosting yet another unique, socially relevant event! NOTE: Mimi and Dona is scheduled to air on public television in November, please check for listings! Photos from LFFoA 2014. 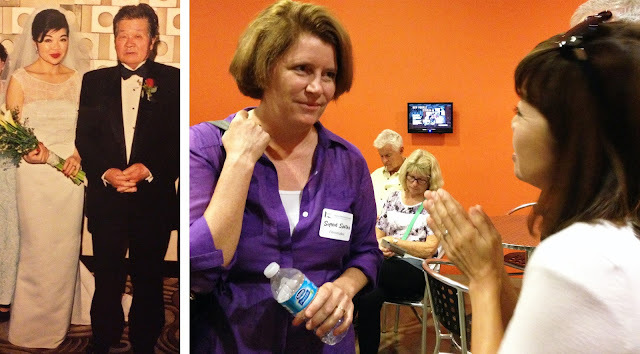 Clockwise from Top Left: Amy and Sheila of LFFoA; Audience members; Koko with Howard and Sheila of LFFoA; LFFoA 2014. Photo credit: Rachael Podlishevsky and Phu Trang. 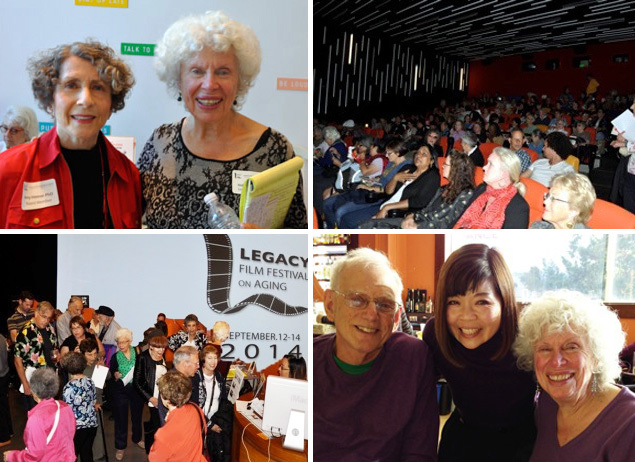 The 5th Annual Legacy Film Festival on Aging (LFFoA) will take place September 18 - 20 in San Francisco! I've been a long-time fan of this fantastic event which features films and documentaries from the US and around the world showcasing the multi-faceted aspects of aging. LFFoA's Executive Director Sheila Malkind is an inspiration! Sheila and the LFFoA team work tirelessly to put together a thoughtful, enjoyable film festival each year. The efforts are paying off as LFFoA's popularity has been growing steadily and people of all ages are gaining interest in aging-related matters. What inspired you to start the LFFoA? I have been in the field of aging in one way or another since I was 25, and shortly will be 77. The life process, including the end of life, fascinates me. I can’t wait to see what 80 will be like! I was the director of a similar film festival on aging in Chicago – Silver Images Film Festival – but the board of directors felt we had gone as far as we could. When I moved to San Francisco in 2003, I saw a need for an organization that would present the issues of aging through the medium of film. Our mission is to educate, entertain and inspire intergenerational audiences about the issues of aging. What do you think is the biggest misconception about older adults or aging? Interesting question. So many misconceptions, but I do think views of older adults are slowly becoming more positive, partly due to the growing aging population, living healthier, longer and more active lives, with higher education. Now 10,000 people are turning 65 every day, and there are fresher views of later life. On the topic of ageism, we are showing THE WALL, a 3-minute film, on Opening Night (Sept 18), highlighting many of the words that have been negatively associated with older adults: Cranky, grumpy, ugly, feeble, ailing, demented, nursing home – and more! What is your vetting process for the films you choose? That is one of the most labor-intensive parts of the festival, which to outsiders sounds like so much fun: watching films! And it is, if the film fits our requirements to be respectful of older adults, and not use stereotypes. And it must be entertaining! We have 5 or 6 people viewing the films we receive or solicit, writing reviews, and even then we will often have maybe’s! What is the biggest joy in putting together the LFFoA? Nada: it's all work! :-) Actually, it's very satisfying to see the end result at the festival, and that our stated mission is being fulfilled. It's also great when people understand that through watching films about older adults life can continue to be meaningful, no matter the age, no matter the very real challenges of later life. Are you planning on some rest & relaxation after the film fest? I will take a vacation with my partner, perhaps in October. However, I have a feeling that we will almost immediately start looking for films – and grants and sponsorship. Despite all the hard work, I can’t help myself! For more information about the event, visit the LFFoA website. Mom was born in 1928 in a small seaside village in the southernmost area of Japan. A middle child from a family of nine siblings, Mom is one of three still living (and thriving)! As I think about the challenges Mom faced throughout her life, I marvel at her ability to maintain a resilient spirit in the face of setbacks. Prior to the second World War, my grandfather passed away at the age of 39 while Mom was in elementary school. With many children to care for, grandmother had to go out and find work. Consequently, Mom left school to become a caregiver to her younger siblings. World War II brought about even greater challenges as food became scarce and rationing became the norm. In the course of her life, Mom has faced various hardships including losing her husband (my father) in 2010 and losing her closest friend late last year. 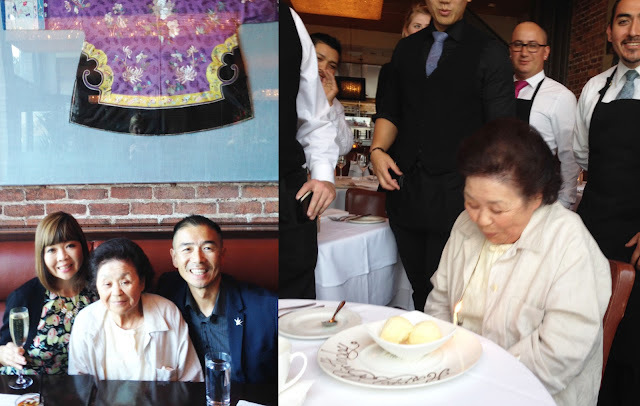 Mom turned 87 this week, and I'm grateful that she is healthy, independent (still drives and is able to travel overseas on her own), and partakes in activities that are both meaningful and joyful. Today there are many Internet articles offering theories and/or personal views on healthy aging, so I decided to list what I think may be Mom's "secrets": Singing without a care if anyone hears; Laughing heartily at jokes made by her favorite comedians; Walking everyday for exercise and for errands; Cooking lots of food and experimenting with new recipes; Not dwelling on trivial matter; Being open to learning something new. Mom aspires to become a centenarian, and I'm beginning to realize that perhaps achieving a healthy, long life requires big heartedness and unwavering optimism. These are qualities that Mom seems to possess in abundance. Thank you for taking the time to read my post! A Celebration! Mom blowing out the candle on her birthday dessert! "I am in between. Trying to write to be understood by those who matter to me, yet also trying to push my mind with ideas beyond the everyday. It is another borderland I inhabit. Not quite here nor there. On good days I feel I am a bridge. On bad days I just feel alone." 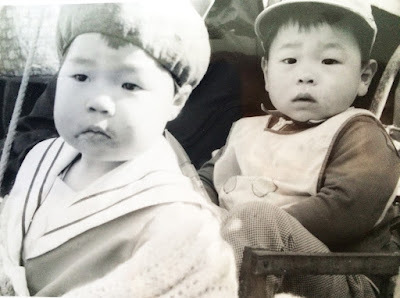 Recently, I had the unique opportunity to share a personal experience regarding sibling conflicts in caregiving on OurParents.com. 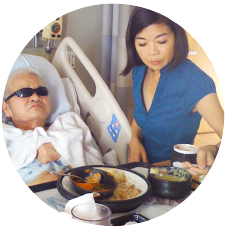 This experience led to my reflecting on cultural differences and expectations regarding the care of aging parents. I grew up in an immigrant household where I assumed responsibilities for grown-up tasks from a fairly young age, including translating business documents and accompanying my parents to their medical appointments. I often felt overwhelmed by my role as a broker between the Japanese and American cultures as I had yet to master English. As a child, I didn’t think about cultural differences; I simply wanted to fit in with my American peers who seemed to have the freedom to explore their childhood. I now realize that my experience was not unusual, and that there were many other children from immigrant families who shared similar situations. We didn’t have discussions about our circumstances and therefore, I thought I was in the minority. Like myself, other children from immigrant families may have wanted to be accepted and to be seen as "normal" American youth. For children of immigrants, challenges become greater in adulthood when aging parents require more care. Due to language barriers and cultural needs, immigrants have fewer relevant resources to rely upon as they age. Thus, it is not uncommon for adult children to provide care for aging parents while juggling careers and raising their own families. In large families, caregiving may seem less daunting because tasks can be divided. Even so, having siblings does not guarantee that the caregiving process would be easy as circumstances vary. In American society, there seems to be a growing awareness of caregivers’ needs and conversations about supporting a diverse aging population. Things are far from being perfect, but I am hopeful that sensible options can be created to respect the needs of aging immigrant parents and their adult children in the coming years. My mother is 87 years old, and we are fortunate that she still drives, exercises daily, and enjoys various activities with her friends. Nonetheless, I know that things may change and that I would eventually assume greater responsibility to assist her (willingly, of course)! Fortunately, studying gerontology and working with aging-related organizations will be useful, as I now have more knowledge and resources to support Mom in a culturally-sensitive, caring manner. Thanks for reading this post. Would love to hear your ideas and experiences on this subject.